Over the years I’ve had the opportunity to deal with some great and success men. From my father, to multimillionaires in their 20’s and owners of empires. It usually becomes apparent quicker than not in interaction, that you get the sense you are dealing with a man of high caliber. Often times there are typical status symbols of a great or successful man; they have a successful business, they’ve reached an expert level or high status within their chosen career. Maybe they have the flashy material items that can just come along with greatness and success. But that’s usually not the only thing. High status, a profitable business, and toys are just byproducts of what come from the characteristics – ingredients, if you will – of great and successful men. They aren’t great and successful because of the cars and top jobs or businesses. They have those things because of a few characteristics. Below are a few stories of when I have noticed these characteristics shine in the great and successful men I’ve crossed paths with. One very large consistency I’ve found among great and successful men is that they are always willing to give back to help others reach successes and greatness of their own. It’s said happiness is found in helping others, perhaps after you’ve reached great heights the most satisfying thing is to help an up and comer. I remember years ago when I was event planning, I had a monthly art and music showcase I was hosting in my city. One month the theme was ‘tattoo’s & rock n roll’. I had originally thought it would be so easy to get many tattoo artists on board to showcase their artwork. As it turned out, many did have the time or interest in participating. As the weeks lead on I was feeling lost and distraught. I had barely any artists confirmed. Eventually one artist reached out from all the contacts I had made. He happened to own a prominent tattoo shop in Winnipeg, Kappala Tattoo. He was willing to meet with me and hear about the event. Upon meeting he offered me over 50 pieces to showcase at my event. The art was valued at close to $10,000 dollars. He had just met me, but believed in what I was doing and trusted me with tons of his personal property. Great and successful men are always willing to give back and help others, if that person proves they have potential themselves. Recently I’ve been working on an Ebook on investing for all my friends and family, as many people have started to ask my for advice on how to begin investing. It’s been a long time in the making, I’ve finally finished and I wanted to get some professional opinions on it before I release it. I figured I would take a shot in the dark and reach out to a top financial advisor in Canada, and the person whom actually set me on the path of financial freedom via his writing, Garth Turner of Greater Fool. Much to my surprise and delight, he responded AND actually read my book. He was very positive with his response saying I was on the right track and hitting the points of investing correctly. He did have a few questions though, he was curious as to why I had a seemingly negative view of financial advisors. Or at least why it was coming across that way in a draft of the book. I’ve stated many times I believe if people take the time and effort to learn about money and finance they can invest by themselves, at least to start. I do believe that at a certain point though it’s almost mandatory to seek professional advice. I believe that should not be a mutual fund dealer, though. As a financial advisor, Mr. Turner could have easily said ‘F*** this guy, bad mouthing people in my profession, affecting or directing away potential business’. But instead he wished to understand why I held the opinion people should be investing by themselves and not with an advisor. If you’re reading this Garth, like I mentioned, I do believe there is a certain point even people who are educated and interested in managing their own money should hand the wheel over to the pro’s. And if you have no interest in money you should definitely have a team of professionals on your side. Great and successful men do not react, they respond. They aim to understand, not get defensive and berate. After I left my first real job out of university I bounced around to few other positions over the years, and tried my hand at a few entrepreneurial projects. Over these years I have routinely reached out to a previous boss for advice or opinion. Each time he has taken the time to answer my questions and give me his thoughts. Looking back I always found this to be a great attribute of his. He could easily have dodged my phone calls as I was no longer an employee making him money. Or he could have taken it personally that I wanted to do something else than work for him. But he didn’t he always gave me support I needed to help me succeed. Great and successful men always want to see others also succeed. They are proud of others wins, and take pride in the success of those as well. They don’t have a scarcity mindset of jealousy. I’ll admit any of the discipline I have when it comes to money and making purchases comes from my father. He is extremely patient and diligence with any purchases he makes. He always instilled the principle of buying something only once you could afford it. I always remembered being angry or jealous when he would turn down my proposals to go out to eat when we were driving by restaurants or not buying me new toys or items whenever I wanted like some of my friends parents. For many years I had friends getting brand new sports equipment each year or new boats and toys. We had some of these things, I always had what I needed but never excess. Now that he is at a place where his investments can pay for what he wants to buys with less apprehension. I also remember the first time I was looking to purchase a car. I was ready to jump at almost each car I liked. Because of my father I passed up so many seemingly great cars. In the end I got a great car, at a great deal too. Great men have serious discipline. Years ago, also during my event planning days I was part of a group that was organizing a large party near my home city. The party was unlike any the city had ever seen at that point with artists, handfuls of rented hot tubs, liquor sponsored by booze companies and more. A true festival. There was also a promise of unlimited liquor all within the price of your ticket. Now from the start the concept rode the line of what was legal with alcohol permits in my province. But the idea was that as long as it stayed under the radar to an extent it shouldn’t raise many flags. My personal method of advertising drew some unwanted attention from various authorities and ultimately the event was forced to be cancelled. The guys in charge had been contacted by the authorities are it was traced back to me where the shut down came from. Arguably, the event was doomed from the beginning. But it was my match that set it ablaze. The organizers knew this could happen, but there was still lots of money that had gone into the event up to this point that was non refundable. I knew a few of the guys personally that had brought me in. We all sat down one day and tried to came to fair settlement to spread out the costs of what had been paid so far, and would not be reimbursed by ticket sales. They wanted me to pay a percentage. Now I could have easily told them to kick rocks, that their game plan was flawed from the beginning. But I did realize my lackluster marketing plan had technically gone against what we had agreed upon as a method to sell tickets. I let them know instantly I was willing to share the responsibility. It was a lot of money for me at the time, but I felt I needed to man up in this particular situation and keep relationships healthy. I’m not saying I’m a great man. But taking responsibility is a characteristic I value in great men. What do you think makes a great and successful man? Do you agree these attributes and characteristics are the makings of a great man? Have I missed anything that you think defines a great and successful man? Please let me know in the comment section. Or if you have any stories of great men in your life I would love to hear them. 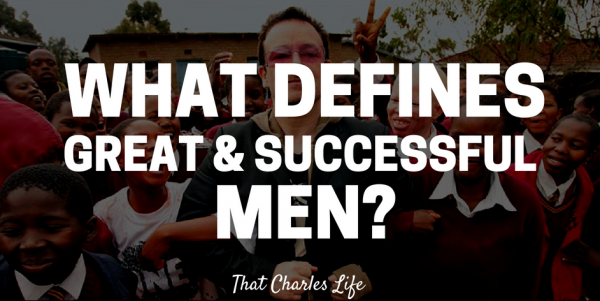 Share this article with sometime to show them what defines a great & successful man!